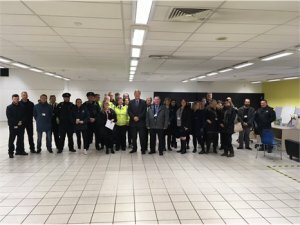 Around 50 officers from a whole range of enforcement and community safety agencies took part in a major operation in Dover Town Centre on Tuesday (4 December 2018) to listen to and take action on issues that mattered to local communities. The day was part of our ongoing work with community safety partners to continue to support regeneration in the town, to listen to and address any local concerns, and to keep the district a safe place to live, work and visit. Operation Clean Sweep, led by the Dover District Community Safety Partnership, focused on Dover Town and Pencester Gardens. Partners involved in the day included: Waste, Environmental Health, Community Safety and Housing teams from Dover District Council; Kent Police; Community Wardens, Inclusion and Attendance Officers, and Early Help Officers from Kent County Council; Kent Fire and Rescue Service; Port of Dover Police; Porchlight; Turning Point; and Kent Community Health. These multi agency operations regularly take place across Kent. The operation was an opportunity to speak with residents, business people and passers-by, to gather feedback, and find out what people’s concerns were so that issues can be addressed. Enforcement action will be taken where necessary and agencies will make repeat visits to premises where there were concerns. 78 residents’ surveys and 21 business surveys were completed for the Market Square redevelopment proposals. Cllr MJ Holloway, DDC Cabinet Member for Community Services, and Chairman of the Dover District Community Safety Partnership, said: "We were very pleased with the success of the day, which was a great opportunity to continue our partnership work to support the regeneration of Dover Town Centre. The turn out on the day from partners was impressive and a high number of residents and visitors were spoken to and given advice and reassurance on community safety issues. The day was not just about enforcement, it was also about community engagement." Sgt Neil Mennie from Kent Police said: "It’s good for different partners to come together to address the community’s priorities. We want communities to know we are there for them and to see us working to identify and robustly tackle issues raised. Agencies benefited from the engagement during the operation, and gained information that will help us continue to support local communities."